"Math Outcomes of African-American Students: The Role of Parent Involvement Strategies"
The National Science Foundation has called for innovative scientific approaches to understand and improve the underrepresentation of ethnic minority students in STEM fields. Prior research has documented contextual and psychological factors that may explain this disparity, including experiences of racial discrimination from teachers and peers that can significantly undermine African-American students' academic well-being, motivation, and achievement. In order to find pathways to effectively attract more African-American students to STEM subjects, we need to investigate strategies that can help them and their families deal with experiences of racial discrimination and thus reduce STEM-related developmental declines during adolescence. As primary socializers, parents have the unique responsibility of promoting their children's talents and skills while simultaneously protecting them against risks, such as racial discrimination, that impede on their potential. Given that parents of African-American students likely implement these protective and promotive strategies concurrently to effect positive outcomes for their children, it is surprising that prior studies typically only examine either protective or promotive strategies, rather than both simultaneously. The present study examines the parental involvement strategies practiced within African-American families and investigate the extent to which specific, co-occurring promotive and protective strategies are linked to African-American students' racial identity, math motivation, and later math outcomes as they move into and through high school. Employing thematic and cluster analyses to examine the co-occurrence of promotive and protective parenting strategies in each household, an innovative reconceptualization of parental involvement is proposed in order to better understand which patterns of involvement strategies are most effective in buffering the effects of racial discrimination and in fostering positive motivational and academic outcomes among African-American families. "The Role of Siblings on the Development of STEM Motivation and Academic Achievement"
The loss of science talent is particularly pronounced among the underrepresented minority population. Despite their growth and size, Latinos are underrepresented in both the attainment of science, technology, engineering, and mathematics (STEM) degrees and in the STEM workforce. High school is an influential point in the STEM pipeline when students get their first chance to quit science courses. Up to 45% of 10th grade students interested in pursuing a STEM degree lose interest by 12th grade. A student’s beliefs in their own academic abilities and perceived values of a subject strongly predict student behavior and performance in coursework. Thus, factors and pedagogies that increase self-efficacy increase student achievement. I am proposing to study the influence of siblings’ beliefs (perceptions of the students’ STEM-related abilities and the siblings' valuing of STEM) on Latino high school students’ STEM motivation and achievement. 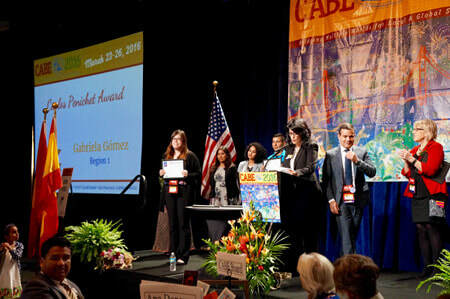 Gabriela Gómez has received the Carlos Pinochet Award from the California Association for Bilingual Education (CABE). Gabriela is pursuing her Multiple Subject Teaching Credential in the UCI School of Education. Currently, she is completing her student teaching assignment in a first grade Spanish dual immersion class. Gabriela comes from a family of Mexican immigrants. In her home, Spanish is the only language spoken. I was taught from a very young age that my native language is very important and that I had to hold on to it like a precious gift. However, when Gabriela started school, her native language was not acknowledged and she was expected to speak only English. She credits her parents for stressing the importance of Spanish to her being able to keep her Spanish. Gabriela wants to be a bilingual teacher to preserve and celebrate the language diversity that others bring to this country. I believe that being bilingual is a very important skill and one that everyone will need in the future. I want to be part of the bridge that helps future adults communicate and connect with each other through the gift of language. Gabriela thanks her parents for the gift of the Spanish language and that she will be able to pass on that gift of language to others. Gabriela Gomez is the fifth UCI multiple subject candidate to receive a CABE award. Past recipients include Wendy (Ramos) Gonzalez (’11), Melissa Madrigal (’12), Megan Gibbs (’14), and Marco Castillo (’14). On Saturday, April 16, SoE hosted the School's 2016 Annual Alumni & Educators Event and Job Fair. 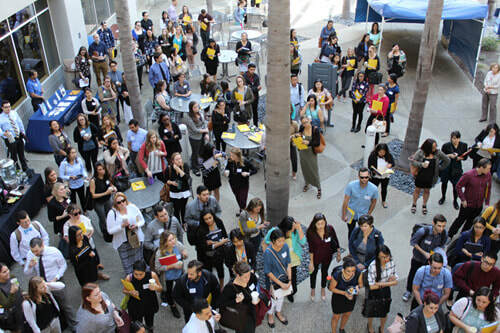 Over 230 educators and School partners came to UCI to participate in the morning workshops and network with colleagues and potential employers. Following registration and refreshments, Director of Teacher Education Virginia Panish welcomed attendees in the Education Courtyard. Coordinators Sue Vaughn and Susan Toma then guided participants toward their pre-selected sets of two workshops. During the 12:00-2:00 pm Job Fair, school and district personnel met with job-seekers to discuss hiring needs and employment options at their sites. Support for the 2016 Alumni & Educators Event was provided by SoE partner SchoolsFirst Federal Credit Union. Associate Professor Liane Brouillette and the Crystal Cove Photography Challenge have announced the 2016 winners from the School of Education. Photographs will be on display in the UCI Student Center Viewpoint Gallery from May 9 through May 28. An awards ceremony is scheduled for May 25 at 11:30 in the Viewpoint Gallery. On April 15, SoE hosted a reception for the St. Margaret's Episcopal School artists from Mary Mayer-Grubb's art classes who had loaned their art for a year-long display in the School of Education's second and third floor art galleries. Two of the displays featured third and fourth grade art commemorating themes from Dia de los Muertos (Day of the Dead) - fanciful skeletons and colorful skulls. The third display showcased second graders' creations of wild things, inspired by Maurice Sendak's popular children's book Where the Wild Things Are. During the reception, Assistant Dean Patricia Collette and St. Margaret's art teacher Ms. Mayer-Grubb recognized each young artist, presenting each with a letter from Professor/Interim Dean Mark Warschauer. ​Thank you for so graciously sharing your art work for display here in UCI's School of Education. Our faculty, staff, and students have enjoyed the delightful representations you and your classmates created, and it has brightened our workdays to be greeted by such interesting and creative designs. Your artwork has been especially inspirational for our credential candidates who are preparing for their future as teachers. You have given them valuable insight into the talents that they should strive to engender in their students. You are fortunate to have art included in your curriculum and Ms. Mayer-Grubb as your instructor. Here at UCI, we consider ourselves fortunate to benefit from your efforts and generosity. St. Margaret's student art work has been displayed in the School of Education's three gallery locations since 2015.